Bonjour Scrap ! : Thanksgiving freebie ! Even if I'm French and Thanksgiving is not part of our Holidays calendar, we will celebrate Thanksgiving with friends (as family is too far away), especially because we have a lot to be thanskful for this year. I have been through a lot this year but the idea is that I've been through. And I'm thanksful for that and for everything I have in life. Let's pop the turkey ! 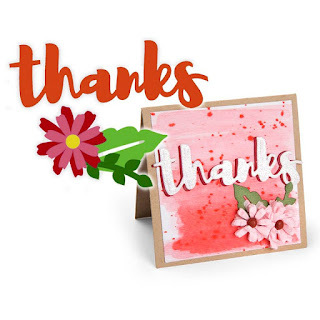 Now about the freebie...I'm sure you will be pretty busy today, but if you have some time, check out the Scrapbook.com website, because they want to give their customer a special thank you for shopping with them- a FREE Thinlits "Thanks" Die Set from Sizzix and Jen Long! Every shippable order today (Nov. 23, 2017) will qualify for a FREE Thinlits "Thanks" Die Set! Want to get YOUR free gift? It's easy! Shop and add items to your cart as you normally would. Once you've finished shopping, head on over to your cart when you're ready to check out. In the cart, you'll be prompted to add the Thinlits "Thanks" Die Set to your order (for FREE!). Just make sure you add the freebie to your cart to ensure you get yours. Shop as you normally would and add items you'd like to purchase to your cart. Then, add one (1) Sizzix - Jen Long- Thinlits Die Set - Thanks with Floral Accent to your cart. This is a FREE gift, while supplies last. Shipping rates still apply. One (1) Thinlits Die Set (Thanks with Floral Accent) per customer, per order, per day during the promotional period for all shipped and pick-up orders. Once again, happy Thanksgiving, I am also thanskful for you visiting my blog.